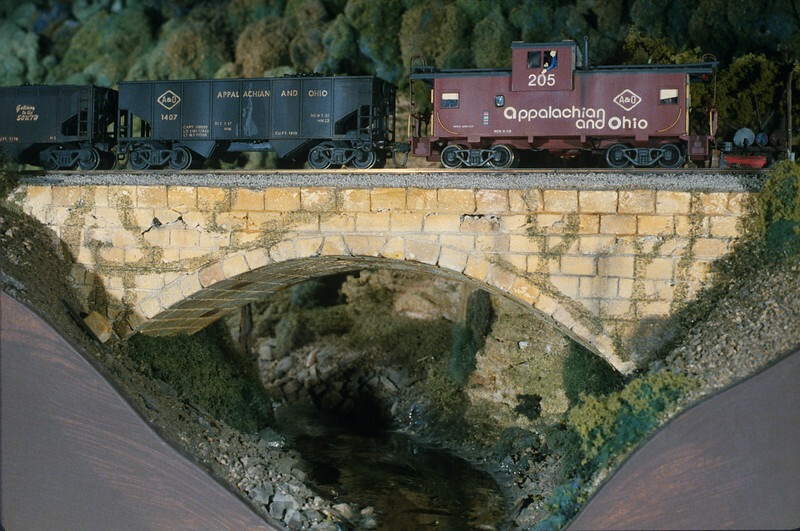 The Appalachian and Ohio Railroad has existed since 1978, first in HO and later in O scale. 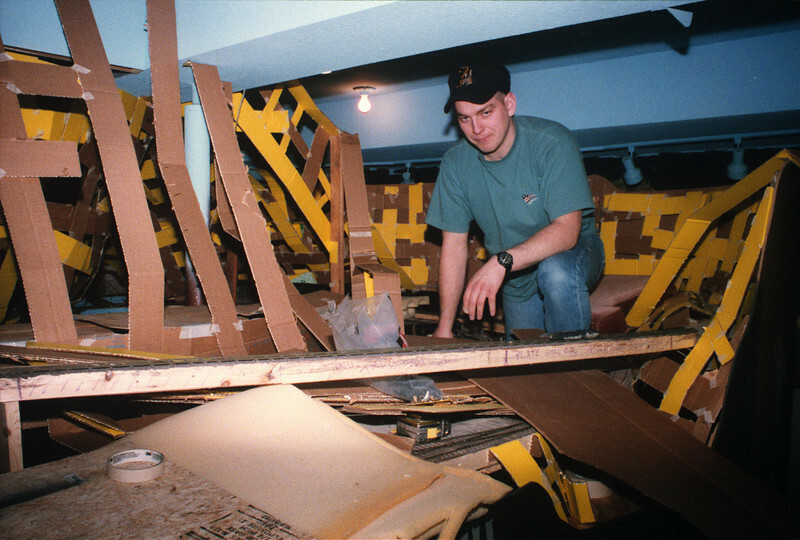 The most recent version, known commonly as A&O 1.0, was under construction from 1994 to 2005 and provided many enjoyable hours of building and operation. The layout was featured in Model Railroader magazine, May 2006. A house sale and the building of a new home in 2006 has provided the opportunity to rebuild the A&O in a larger and more railroad-friendly space. Many of the same features that proved successful on 1.0 are being replicated and even expanded upon on the new layout. Similarly, weaknesses of the first design have been addressed and hopefully repaired. For a full discussion of this process see the article in Model Railroad Planning 2009. 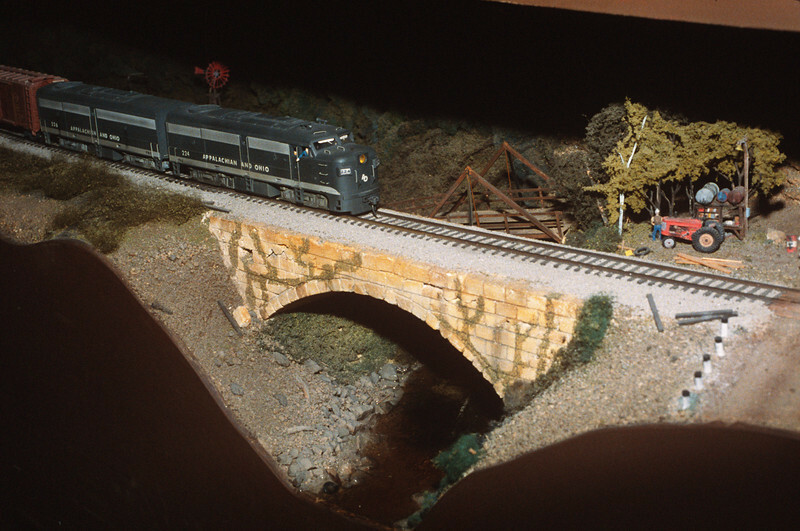 The A&O has existed in several basements around the country and was largely a solo effort from 1978 until 1996 when various members of the Northern Colorado Model Railroad Club began to participate in the fun. My son, Joel ("Joel Beach" - helper, dispatcher, web designer), Rick Bacon ("Ricksburg" - car builder specialist), Jay Barnaby ("Jay" - hopper construction guru), Vince Griesemer ("Point Vincent" - Signal system designer), Bob Sobol ("Sobol Springs" - all things electrical, loco owner/builder extraordinaire, ETC. ), Bob Brooks ("Brooks" - all around helper, in memorium), Mark and Craig Linn, Bill Wood ("Linnwood" - framing and track), Frank and Levi Sell (all around helpers), Doug Geiger ("Geiger's Gas and Grill" - layout design), and numerous others have generously contributed their time, talents, and resources to make the A&O what it has been, and is once again becoming today. The first incarnation of the A&O was while living in Cincinnati, Ohio. 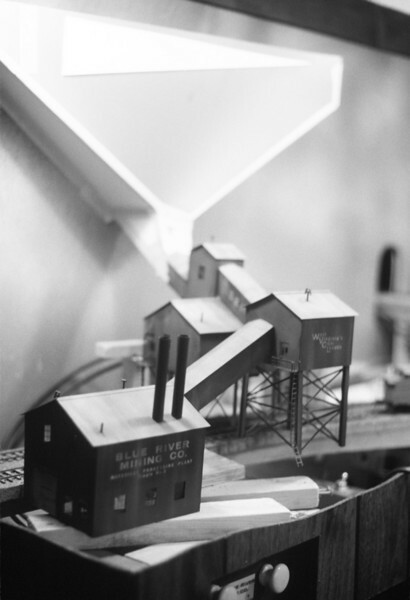 The influence of the Appalachian modelers in that lower mid-eastern region, and most notably visits to Allen McClelland's V&O in the nearby Dayton area, led to the formation of the railroad name and solidified my interest in Appalachian coal railroading. Already a 15-year HO modeler, 1/87 equipment was purchased and a paint and lettering scheme begun. The layout space shared the family room with the rapidly growing number of Stewarts and was an 'around the walls' design. Of particular note was the construction of the first operating coal loader- the Blue River Mining Company. Old Mantua operating hoppers were the anticipated method of discharge. Scenery and track were never completed, but trains did circuit the room. A move cross country to Spokane, WA provided a small, but workable railroad space for the second incarnation of the A&O. Again the layout circled the room and was double decked. Scenery techniques were developed on this layout and the paint and lettering schemes continued to evolve. It was toward the end of our time in Spokane that I discovered the stunning visual appeal of O scale and began to dabble with the King of Scales. It proved to be the beginning of the end of my HO days. It was at the ?87 Eugene NMRA Convention that I stood jaw-dropped, looking at Jim Harper's O scale modules. The detail seemed to literally grab me. The mass and sound, visual drama, and inherent realism left me utterly transfixed. I loved it. That day is forever etched in my mind- and with a large collection of carefully decorated HO scale A&O equipment at home.....I didn't sleep very well that night. Okay, so if the O scale equipment looks good; I mean, REALLY good, what does O scale scenery, a favorite aspect of the hobby for me, look like? Could I build scenery in O scale that could equal what the equipment obviously had to offer? If not, I could move away from the temptation; no harm done. The question was answered by constructing a small diorama, using it as both a test and a potential photo backdrop for the couple O scale car kits I'd decided to let myself purchase. The diorama eventually became the cover of 48'/O Scale News, August '94. A later photo-article for that magazine described the construction process. But the diorama had answered the question in the affirmative- in a big way- and the journey continued. As good fortune would have it, Weaver Models (the Athearn of O scale) introduced their Alco RS3 just as all this was taking place. It was affordable, offered good detail potential, and ran reasonably well. I bought my first O scale engine, an undecorated RS3, for $100 at the Stamford, CT O Scale National Convention in 1991. Detailing and developing a paint scheme for my new RS3 treasure became an obsession and only further enamored me with the realism potential of O scale. Soon the finished loco was posing proudly on the rails of the diorama, mated to the two or three cars I owned, and asking for every conceivable photo angle. It was then I decided that...I would have a second, O scale switching railroad to go along with my next HO A&O empire. Time, space and money soon dictated that I chose one scale or the other. But which one? Parting with my carefully nurtured and pampered HO equipment roster would be like selling off my kids - sort of. But a reflective analysis of which scale I had, and wanted to, spend my time on, and which models really got my railroading juices flowing easily answered the question. Soon I was parting with pieces once considered almost sacred, and eagerly anticipating what would be replacing them. Sharing this quirky journey with my brother-in-law, Larry Hansen, produced some fun sketches of the process. With the decision made, I set about to design a railfan's perspective model railroad, wanting to utilize the size advantages inherent to O scale and combining these with numerous design ideas I'd thought about for several years. The concepts were described in the May '06 Model Railroader along with photos of the mostly finished layout. Many times of fun and operating sessions were held before its demise. It proved to be, if it's possible, even more enjoyable than hoped for. The A&O 1.0 section reflects those days and usually its more finished appearance. But absent from its pages are photos of early construction of that layout. Therefore I've added here selected snapshots of those construction years. (Note: the link to Bob Sobol's "smugmug" site also contains many early archived photos of those days).